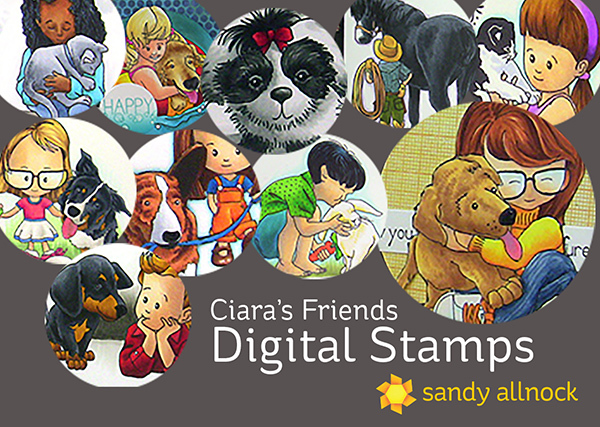 Ciara’s Friends – in DigiStamp form! While on my current business trip, I’ve been doing what many of you have asked for….creating digital files to put my “Ciara’s Friends” stamp sets into the webstore! This was a stamp series once available for purchase as red rubber stamps; that season ended, and I kept meaning to put them in the store, and well – you know how to-do lists go. Things slide. But this one kept me busy during evenings after my teaching sessions, and now the stamp sets are in the store! Each listing has a card image in the photos section so you can see how they color up. I’ll be back tomorrow with two new videos – and a bloghop! So fun to see all of these again.